This weekend, the sports world will be watching college football’s championship weekend, where contending teams will decide their College Football Playoff fate. Of the major power conferences, four of them have championship games this weekend. Ironically, the only one that doesn’t have real playoff implications is the SEC Championship Game, where Alabama could lose to Florida by a Georgia Tech-Cumberland score and probably still make the playoff. In the ACC, Clemson is faced with a likely win-and-in scenario against Virginia Tech. Things are much more cloudy in the Big 10 and Pac-12, where Penn State-Wisconsin and Washington-Colorado could end up being de facto national quarterfinals where the winners advance… or both could be left home. And even though the Big 12 does not have a championship game at the moment, the Bedlam rivalry game between Oklahoma and Oklahoma State serves as one in practice. The Sooners have an outside chance at a Playoff berth, but probably have to beat the Cowboys in impressive fashion and hope a bunch of other results go their way. Speaking of which… if there were to be an upset or two or three in this weekend’s games, it could turn the top four into absolute chaos. Maybe Michigan isn’t done with yet. Maybe Colorado or Oklahoma or Penn State can sneak in. Maybe two or even three Big Ten teams make it in. Even though the last few years have been dominated by chalk in conference championship games, there is a rich history of upsets in the final week before the bowl season. Top 2 teams are 20-6 in the history of conference championship games, with two of those losses coming in back-to-back No. 1 vs No. 2 Alabama-Florida showdowns in the late 2000s. Top 4 teams are 28-13 all-time in conference championship games. Amazingly, a Top 4 Big Ten team has yet to win a title game (you’re welcome, Ohio State) while ACC teams are 3-0. The Big 12 has produced by far the most chaos over the years (as you’ll see in the rankings below) with Top 4 teams only 7-5 over the years. Here are the five biggest upsets from conference championship games that shook the college football nation. While seeing the top-ranked team in the country fall at the final furlong is traditionally classified as an “upset,” there weren’t too many people surprised by this result. In fact, Oklahoma actually came into the game as three-point favorites as the Sooners had given the Tigers their only loss on the season. Oklahoma outscored Mizzou 24-3 in the second half as Sam Bradford threw for two touchdowns. Postseason Impact: In perhaps the most chaotic end-of-season sequence in recent memory, Missouri missed their chance to play in a BCS title game as did No. 2 West Virginia. Even though Oklahoma made their case convincingly, Ohio State and LSU were selected to play in the BCS Championship Game where the other Tigers emerged victorious. Entering the 2013 Big Ten Championship Game, Urban Meyer had won his first 24 games as head coach of the Ohio State Buckeyes. After an undefeated 2012 season ended without a title game or bowl appearance thanks to a one-year postseason ban, the Buckeyes finally had their chance to play for a national championship. That’s when Michigan State stopped the Buckeyes’ title hopes dead in their tracks, as they have many times before. In a game of wild swings, Michigan State opened up a 17-0 lead before the Buckeyes scored 24 straight to take the lead. However, Connor Cook and Jeremy Langford led Sparty back, scoring the final 17 points to win, 34-24. The Spartans outgained the vaunted Buckeyes offense of Braxton Miller and Carlos Hyde 438-374 as Mark Dantonio’s program became a force to be reckoned with on the national stage. Postseason Impact: Ohio State’s loss opened the door for #3 Auburn to take the #2 spot in the rankings behind an undefeated Florida State. The Seminoles defeated the Tigers in the last BCS Championship Game before the advent of the playoff, ending the SEC’s streak of seven straight national championships. The first Big 12 Championship Game was also perhaps the best. R.C. Slocum’s Aggies team upset Bill Snyder’s undefeated Wildcats to knock Kansas State out of the BCS National Championship Game. Texas A&M came back from a 15-point deficit in the fourth quarter to force overtime. After the teams traded field goals in the first overtime period, A&M won it in the second overtime. Aggies running back Sirr Parker raced through the K-State defense and into the end zone for the winning score on a 32-yard touchdown reception. Postseason Impact: Entering the week, there were three unbeaten teams — Tennessee, UCLA, and Kansas State — and just two slots in the national championship picture. Before the Wildcats went down to the Aggies, UCLA had lost to Miami in a last week showdown, making K-State’s loss even more painful. ACC champion Florida State was selected out of the gaggle of one-loss teams that included Ohio State, Kansas State, UCLA, Arizona, and Wisconsin. The Volunteers would go on to win the national championship. All right, you caught us cheating in our “Top 5” list by adding two games from the same year back in 2001. You may recall this as the infamous year where Nebraska got 62 points hung on them by the Buffaloes, failed to win their division, and still made it to the BCS National Championship Game. (See, there is precedent for this!) No. 1 Miami was a lock to make it as they were the dominant force in college football at the time. But who would join them? Colorado followed up their demolition job of Nebraska by avenging their loss to the Longhorns earlier in the season. Chris Brown rushed for 182 yards and three TDs while Texas really lost the game in the first half,thanks to Chris Simms’ three interceptions. A Major Applewhite led comeback was always going to fall short after Colorado had built up a big first-half lead. The following week in the SEC Championship Game, Tennessee missed out on their chance to return to the National Championship Game in a loss to LSU. The Tigers outscored the Volunteers 21-3 in the second half and Tennessee hasn’t been that close to a national championship in the 15 years since. Postseason Impact: Where do we begin? Even though they had two losses, Colorado had an extremely strong case to play Miami after beating the #2 and #3 teams in the country. In the end, they had to settle for playing the role of the most impressive spoiler in NCAA history. Even though they were ranked 4th in the AP Poll, the BCS went back to Nebraska to play Miami in the BCS National Championship Game. The Cornhuskers leapfrogged the Buffaloes and one-loss Pac-10 champion Oregon. We all know how that turned out. If there’s one conference championship game that stands out in the memory as an upset, it has to be the 2003 Big 12 Championship Game. 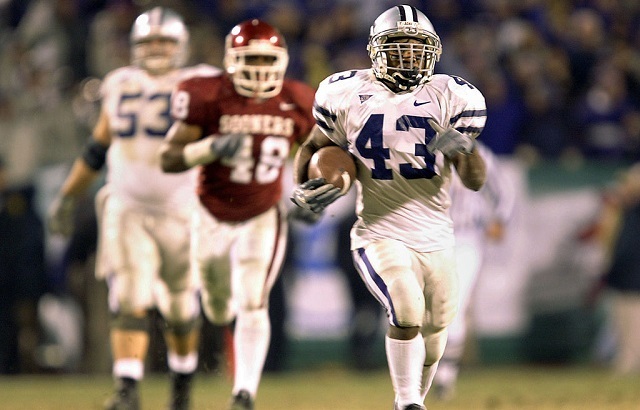 It’s not that #1 Oklahoma lost to Kansas State, it’s how thoroughly they were outplayed and outclassed by the Wildcats that night at Arrowhead Stadium. Star running back Darren Sproles had a jaw-dropping 323 yards from scrimmage and Ell Roberson threw four touchdown passes for one of the biggest upsets in college football history. Oklahoma had been undefeated and the #1 ranked team in the AP Poll from the preseason all the way up to the Big 12 Championship Game and K-State just mauled the Sooners. Postseason Impact: Incredibly, none. In spite of the huge loss, Oklahoma was still selected by the computers to advance to the BCS National Championship Game. After the season was done, the Sooners were joined by USC and LSU as the top three teams in the country, all with one loss. Unfortunately for the Trojans, they were the odd team left out. LSU would go on to defeat the Sooners in the BCS title game, while USC defeated Michigan in the Rose Bowl. The two schools split the national championship that year, with LSU topping the coaches poll and USC the AP poll. It would take college football another decade to figure out the whole “playoff” thing.